The species has a scattered distribution in Britain as far north as central Scotland, but is widespread only in parts of southern and eastern England. It is widespread in western and central Europe. 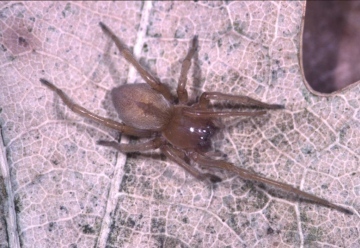 The spider occurs under stones, or low vegetation such as heather, in dry, sandy or sparsely vegetated areas in open habitats such as heathland, waste-ground and dunes. It generally remains in a silk cell during the day and the egg-sac is also hidden away under a stone. Although mostly uncommon it is probably the Cheiracanthium species most often found on heathland and particularly on young heather. Adults of both sexes are found mainly in late spring/early summer and autumn. Although generally uncommon, the spider may be quite frequent in the south. Recorded from 54 hectads since 1992. Potential threats include loss of dry heathland to agriculture and urban development as well as damage to sand dunes due to recreational pressures. Protect heathland sites from encroachment by agriculture and urban sprawl and manage sand dune sites to reduce recreational pressures.